Context: Children's pain in hospital settings has not yet been managed well. Although nurses play an important role in pain management, its extent is limited with respect to clinical nurses in Iran. Aims: This study was conducted to explore the experience of nurses' barriers to pain management in pediatric units. Settings and Design: This qualitative study was conducted at two teaching hospitals in Amirkola Children's Hospital in Babol and Children's Medical Centers in Tehran, Iran. Data were collected from 19 nurses, using unstructured and deep interviews during 2014–2015. Material and Methods: Sampling was purposeful with maximum variation. Data analyzed by conventional content analysis method simultaneously data collection based on five steps of Granheim and Lundman (2004). To ensure about the accuracy and reliability of data, four criteria namely credibility, confirmability, dependability, and transferability, were used according to Lincoln and Guba's criteria. Before the interviews, participants were ensured about the confidentiality of their information and voluntarily nature of the study. In addition, written informed consents of the nurses were obtained. Results: Data analysis extracted five themes of barriers to pain management, including: Inappropriate organizational structure, interruption in pain relief activities, inadequate competency of the nurses, individual characteristics of child and parents, and inefficacy of companions. These themes indicated the barriers to pediatric pain management based on research conditions and experience of nurses in the pediatric ward. Pain relief is known as an important quality in medical care for pediatric. Pain has been reported as the third issue in medical care. Studies showed 60%–80% of patients have unrelieved pain., Inadequate pain assessment and management lead to ineffective care and prolongation of hospitalization. Untreated pain may cause a significant disability and increases the risk of death in pediatric patients. Nurses are morally and spiritually responsible for easing the patients' pain. This is the position where they play a key role in pediatric pain management. Pain assessment, prescription of analgesics, and the use of other pain-relief techniques are of professional responsibilities of nurses. Moreover, they are responsible to eliminate pain and suffering when possible. Pain management includes all methods used for preventing and reducing pain. The objectives of pain management include: Reducing the intensity and duration of pain, as well as physiological and emotional stresses; increasing patient's capability in adaptation and improvement; and developing effective interventions with minimum risk for the patient. Despite decades of research and availability of analgesic approaches, many children experience a moderate to severe pain, specifically after surgery , Inadequate pain management is a global problem  and the need to enhance the management is well documented. As pain management is inadequate in worldwide. The causes of poor pain management include inadequate staff training and access to information, lack of access to analgesic, especially narcotics, resource limitation, cultural diversity, language barriers, lack of time, working pressure, reluctance of clinical nurses to prescribe analgesics, and lack of nursing knowledge about prescribing narcotics. Twycross (2013) showed that nurses and medical staff lacked pain management knowledge. Participants also attributed some barriers to staff, child, parents, and relevant organization. Also, Twycross study shows the need for more detailed research in nurse-child-parent interaction. Farahani reported the lack of pain assessment appropriate tools for the child's age as a barrier to pain management, and eliminated this deficiency by designing a pain-assessment flowchart to be included into the child's medical record. One goal of Ljusegren was the identification of the factors affecting pediatric pain management, leading to determination of four themes: Cooperation; child; organization and nurses. The majority of previous studies on pain management issues are quantitative and qualitative studies the lack of. A number of studies have suggest that pain in most patients is left untreated, and this problem is tied with the lack of study into understanding the nurses' experiences of pain management barriers. There are few qualitative studies regarding the barriers of pediatric pain management from nurses' view. Studies have shown that nurses' experiences of pain management barriers are context-based, and organizational culture affects pain management of clinical nurses, insofar as social context of each ward influences pain-assessment methods used by them. Therefore, given the context-based nature of this phenomenon and comprehensive understanding of barriers' influences pain management. This study was conducted to explore the experience of nurses' barriers to pain management in pediatric units. This qualitative study was conducted to explore the experience of Iranian nurses of barriers to pain management in pediatric wards, using conventional content analysis. This method is usually used for describing a phenomenon when there are limited numbers of relevant theories or research. The participants consisted of 19 nurses (16 nurses and 3 head nurses) working in different wards of two educational pediatric hospitals namely Amirkola Pediatric Hospital in Babol and Children's Medical Center in Tehran [Table 1]. For initiation of interviews, purposive sampling was used. The inclusion criteria were at least 3 years of working experience in different pediatric wards, enough experience, and willingness to participate. Before the interviews, participants were ensured about the confidentiality of their information and voluntarily nature of the study. In addition, written informed consents of the nurses were obtained. Simultaneous data collection and analysis were performed to develop the themes related to the nurses' perceptions of influential barriers to pain management. The data collection process was continued until data saturation in the last three interviews. After gaining their written informed consents, appointment times for interviews were arranged. The unstructured individual interviews were carried out in a quiet room in the hospitals. The interviews a long from 60 to 90 min. All of interviews was recorded by taper recorder. These interviews began with asking, “Please, describe your routine work shift.” In pain management, cases, questions were concentrated on it; it not, the next question was asked, “Have you ever faced with pediatric pain in your work shifts?” The interview was then asked, “Please, tell your story about facing with pediatric pain.” Afterwards, explanatory and profound questions were asked (“Please, describe more.” “What do you mean?”). Data collection and analysis were done simultaneously during 18 months in 2014 and 2015. The MAXQDA10 software was employed for transcription and classification of codes. This study employed conventional content analysis. Graneheim and Lundman have proposed following stages for using content analysis with qualitative data: (1) Transcribing the whole interview immediately after it is done, (2) Reading the whole transcribed text to gain a general knowledge of its content, (3) Determining the meaning units and initial codes, (4) Categorizing similar initial codes in more comprehensive groups, and (5) Determining the main theme of per category [Table 2]. The researcher conducted data analysis under the supervision of two other qualitative experts. To ensure about the accuracy and reliability of data, four criteria namely credibility, confirm ability, dependability, and transferability, were used according to Lincoln and Guba's criteria. To increase data credibility in this study, prolonged engagement and participants review strategies were employed. The prolonged engagement with participants (for 2 years) was performed by researcher through long-term on-site observation of pain management by nurses. After coding process, the transcribed interviews were returned to the participants to ensure about the accuracy of codes and interpretations. To control the conformability of data, the opinions of two research team members, who were experienced in qualitative studies, were used. Discussions on disagreed codes and categories were continued by research team members until the clarity of subject and consensus was achieved. To check the dependability of data, the obtained categories were given to three nurses, not the participant in the study, to confirm data fit. To check data transferability, sampling was done with maximum variance of nurses. The five elicited themes of pain management are: Inappropriate organizational structure, inadequate nursing competency, interruption in pain relief activities, individual characteristics of child and parents, and inefficacy of companions. Shortage of staffing in pediatric units leads to nonscientific division of labor and inappropriate work schedule that challenge pediatric pain management. The lack of relevant nonpharmacological interventions for pain management also results in poor involvement of nurses in clinical decision-making. In addition, due to the lack of equipment and undesirable physical setting of the unit the nurses are doomed to failure in pediatric pain management. The mismatch between staff-number, patients-number, and workload ends in failure of nurses in pain management. Shortage of staff leaves low-level managers (nurses) with no choice but to select the division of labor, which is not appropriate for pain management. Therefore, managers also have to consider more intensive work schedule for the staff, which nurses have difficult in pediatric pain control. “We haven't enough time to use pain-assessment tools for large number of child” (Nurse 10). “The severity of staff shortage was to the extent that I have to dedicate morning and afternoon shifts with no day-off to monthly work schedule of all nurses, regardless of their experience” (Head Nurse 1). The other characteristic of inappropriate organizational structure is the limited autonomy of nurses in performing their tasks. Nurses are not free in performing their roles even in nonpharmacological pain protocols, and must observe physicians' orders. They are not involved in selecting pain-relief practices or analgesics. They also do not relieve pain in children before informing the physicians. Their main role is indeed limited to awaring the respective doctors for prescribing analgesics and diagnosis of pain cause, and reporting postintervention condition of the patients. “I always ask the doctor if I can use a hot water bottle for easing the pain in the child” (Nurse 6). “Immediately after the onset of pain in patients with gastrointestinal illness, I call the resident to say she/he really has pain, does she/he have any analgesic order or something?” (Nurse 12). Poor workplace is another problem in this subject. The lack of pain relief equipment, inappropriate physical setting, and the lack of a standard pain relief protocol for nonpharmacological interventions have limited nurses in pain management. “There is no separate form or specific tool for pain assessment and record” (Nurse 4). Interruption in pain relief activities is another barrier on the theme of pediatric pain management. Delay in pain diagnosis and control due to late presence of nurse and doctor at the patient's bedside, defective equipment, manipulation of orders, and delay in analgesic injection result in the interruption of activities related to pain relief. Nurses attributed the delay in nursing interventions, improper caregiving, and inadequate timely pain relief to delay in pain diagnosis and treatment caused by defective equipment and slow process of access to opioid. “As pethidine is kept in the nursing office, access to it involves undergoing some procedures” (Nurse 10). Nurses manipulate doctor's orders by administering lower dosage of medicines or postponing analgesic injection. “Methadone tablets should be taken every 8 h, but I did not give it until the onset of pain to avoid patient's dependence and addiction to it” (Nurse 7). Unprepared child or family, especially mother, for a painful procedure causes the companions a great stress and agitation, keeping the child or his/her parents from cooperating in pain management procedure. “Due to the lack of experience in early work days, I performed test on patient with no prior explanation, and this led to the lack of cooperation from the child” (Nurse 3). Delayed examination or late presence of physicians retarded the use of pain relief measures. “I cannot administer analgesics for abdominal or acute pains, pain relief is delayed until the presence of doctor and then some measures are taken” (Nurse 9). Nurses overlook pain in daily planning and examinations during a work shift. They also do not prioritize pain relief measures over other activities. “In a daily work shift, pain is not taken into consideration until the patient complains of it” (Nurse 8). Inadequate nursing competency is another barrier on the theme of pediatric pain management. Such nursing deficiencies as inadequate experience, lack of knowledge, overlooking pain assessment, and the lack of in-service training programs result in their negligence in pain assessment and relief processes. In addition, as the prescription of analgesics is done only by doctors and nurses only execute doctors' orders, they overlook pain assessment tools. “I did not participate in any in-service training program for pediatric pain relief, and most often use my experience in treating other patients” (Nurse 1). “Like nurses, I have not seen any doctor who use pain assessment tool and issue orders based on it” (Nurse 10). Individual characteristics of child and parents are another barrier on the theme of pediatric pain management. According to nurses, some parental characteristics such as the lack of maternal experience and mother's mood are two barriers to pediatric pain management. “Young mothers are helpful, but lack experience. They feel nurses are distracting them by nonpharmacological methods so as to not doing their job, or a mother is agitated with a slight pain in her child and wants to make rackets in the ward” (Nurse 12). In addition, child's characteristics such as mood and age are effective factors in his/her reaction to pain and acceptance of nonpharmacological pain interventions. “Children with slow temperament rarely express their pain and communication with them is easier” (Nurse 6). The theme of inefficacy of companions consists of three marginal themes namely inadequate competency, inadequate cooperation, and willful parental intervention. Companions are not adequately competent for making nonpharmacological pain interventions, and thus tend to accelerate pain-relief process by inadequate participation in performing such interventions. Some parents willfully interfere in pain management process and administer analgesics. Due to lack of knowledge about nonpharmacological pain interventions, parents are not competent enough to cooperate with nurse. “Companions lack (relevant) knowledge and have not been trained in nonpharmacological pain interventions, and don't know that sometimes children can be comforted just by talking and playing” (Nurse 12). Companions do not cooperate adequately and tend to accelerate the pain relief process with pain medication. Mothers (sometimes) start arguing with medical team for delay in the administration of medication. This makes staff use medication to avoid tension in the ward and being reported to superiors. In addition, early medicinal interventions comfort mothers. “One mother persisted on using medication to calm her child, saying that my child does not relax with these nonpharmacological practices” (Nurse 10). “Giving medication to child calms down his/her mother, thinking that her child undertakes medical procedure, but when I don't use medication mothers say why you don't do anything for my child?, why you don't use medication?, thus I have to make medicinal interventions soon enough” (Nurse 16). Some parents willfully interfere in pain management process and administer analgesics without permission and awareness of the nurse. “Sometimes mothers use acetaminophen drops without telling us” (Nurse 9). 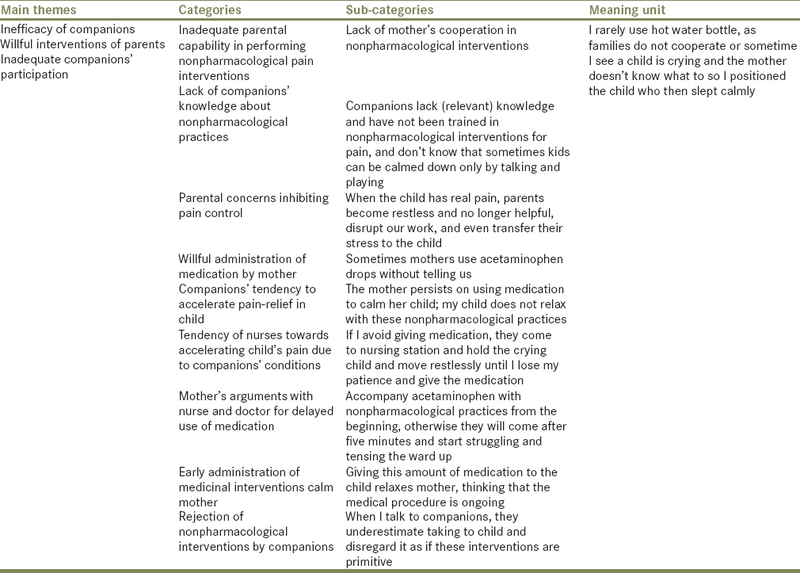 Parallel with the objective of this study, explanation of barriers to pediatric pain management, results show the perceived barriers to pain management as follows: Inappropriate organizational structure, interruption in pain-relief activities, inadequate nursing competency, individual characteristics of child and parents, and inefficacy of companions. Therefore, nurses interrupt pain relief activities in children due to following reasons: Facing with inappropriate organizational structure such as staff-workload mismatch and inappropriate workplace; nursing incompetency caused by the inadequate scientific and practical knowledge of pain management; delay in pain diagnosis and alleviation due to late presence of nurse and doctor at the bedside, defective equipment, and/or manipulation of orders. Child's characteristics such as mood and inefficacy of parents like willful interventions, rejection of nonpharmacological strategies, and lack of cooperation in pain interventions result in nurses' failure in pediatric pain-relief process. Twycross (2013) in a study aiming at describing nurses' views about the barriers and facilitators to effective management of pediatric pain indicated such factors as organizational factors (lack of time and a heavy workload, staff shortages, lack of equipment to distract children) factors relating to child and parents (children exaggerating their pain scores, child's age, child's culture) and factors relating to staff (nurses' lack of knowledge, nurses' personal judgments, insufficient analgesia prescribed). Findings of the Twycross's study are consistent with those of this study. The present study concluded inadequate parental participation in nonpharmacological pain interventions in children. This is due to the lack of parental competency and knowledge about such interventions and the dominant culture of medication administration in Iran, in which parents tend more to the use of medication for pediatric pain-relief. Namnabati et al. in a study on the barriers to pediatric pain management identified three themes, namely organizational barriers; child's individual characteristics induced limitations, and barriers to the nature of disease and its treatments. Their findings showed that organizational limitations such as the lack of autonomy in prescribing some medical interventions, inadequacy of equipment, accessibility to opioid as the main pain-relief substance, and other child-related limitations like age, mood, behavior, and gender affect examination and treatment of pain in the child. Similar to recent research, this study has show that individual characteristics of child, as well as organizational limitations and background factors can inhibit the use of nonpharmacological pain-relief practices in children. In contrast, immediate use of opioid, due to its accessibility, is increasing in popularity. Similar to this study, Batiha et al. reported the nurse-patient number mismatch as a main barrier to pain management, as this imbalance limited nurses' time in providing better services to patients. Other studies also mentioned the lack of personnel, heavy workload, and mismatch between workload and patient-number as organizational barriers to pain management., In general, adequate number of staff improves pain management process. Findings showed that delay in pain diagnosis and treatment caused by defective equipment and difficulties in accessibility to narcotics interrupted pain-relief activities in children. Rejeh et al. also reported that nurses had to ask for narcotics from other wards or nursing office, which delayed pain-relief process. Batiha reported lack of analgesic drugs as a barrier to pain-relief in patients. They manipulate doctor's orders due to their concern about child's addiction to narcotics by lowering the injection dose or not-using them in certain times. Twycross (2013) also reported the fear of administration of high dose of analgesic and thus administration of inadequate dosage of it by medical staff as staff-side barriers to pain management. Results showed that inadequate nursing competence such as insufficient experience, knowledge deficits, underestimation of pain assessment, and the lack of in-service training programs keep nurses from providing timely and appropriate pain care and management. Other studies also indicated inadequate knowledge of doctors and nurses in pain management, lack of pain control guidelines at bedside, and knowledge deficits about nonpharmacological pain interventions as barriers to pain management., Svendsen showed that the nurse factors had greater effect than workplace and child's characteristics on the use of nonpharmacological pain practices; although, nurses' skills in applying these techniques were beneficial, their knowledge deficits inhibited them from using such practices. Results showed that nurses regarded individual characteristics of child and parents as barriers to pain management. This finding is consistent with Namnabati's study, in which child's characteristics such as age, gender, and mood were considered as salient barriers to pain management; for example, pain-assessment is difficult, especially in infants who lack verbal capabilities and are incapable of differentiating between pain and fear. Twycross (2015) also shows that child's behaviors affect nurse's perceptions. Noisy and very active children or very interfering parents tend more to analgesics than slow mood children and passive parents. In addition, nurses tend more to prescribe analgesics for children who verbally express their pain. Therefore, child's age is an important factor in pain-assessment, and older children report higher pain scores. According to the results, nurses regarded inefficacy of companions in form of inadequate participation, and insufficient competence of parents due to their lack of knowledge about interventions as key barriers to the use of nonpharmacological pain interventions by nurses. These findings are consistent with the findings of Twycross and Gimbler-Berglund. They also reported the rejection of pain care recommendations by parents and their persistence in using analgesic,, whereas, He reported parental participation in child care as a determinant factor in using nonpharmacological pain interventions. Chng et al. also indicated the need of parents to acquire more knowledge and information about pain management, and providing them with training in nonpharmacological interventions, which would eventually improve the use of pain-relief strategies in children. The outcomes of the present study showed that nonpharmacological interventions by companions were unacceptable. Park et al. also reported the lack of trust in the effectiveness of nonpharmacological treatments as barriers to pain management. Willful parental interventions are another barrier to pain management. Other studies also reported parental interventions, such as responding on the behalf of their children, leaving nursing staff unaware of the child's pain, or their passive role in pain care, as parents-side barriers to pain management. These findings give greater insight into the barriers that affect pediatric pain management. Success or failure in pain management largely depends on these influential factors in practical patient care. This study represents the nurses' experience of pain management in pediatric wards in Iran. To achieve an optimal pain management process, modification of organizational structure, improvement of nursing competence, individual characteristics of child and parents, improvement of companions' efficacy, and removal of pain-relief delaying factors should be prioritized in planning. Regarding nursing care plan in Iran, child care is most often done by female nurses; therefore, noninvolvement of male nurses may drop some aspects of pain management that relate to nurse's unknown gender. The involvement of male nurses in future studies is recommended to explain the barriers of pain management in pediatric wards. This study was financially supported by Tarbiat Modares University. This study was extracted from a PhD thesis conducted at Tarbiat Modares University of Tehran. Hereby, we extend our gratitude to Tarbiat Modares University for the financial support of this study. We would also like to thank all the participants for assisting us in this research project. Taddio A, Chambers CT, Halperin SA, Ipp M, Lockett D, Rieder MJ, et al. Inadequate pain management during routine childhood immunizations: The nerve of it. Clin Ther 2009;31 Suppl 2:S152-67. Downey LV, Zun LS. Pain management in the emergency department and its relationship to patient satisfaction. J Emerg Trauma Shock 2010;3:326-30. Kozlowski LJ, Kost-Byerly S, Colantuoni E, Thompson CB, Vasquenza KJ, Rothman SK, et al. Pain prevalence, intensity, assessment and management in a hospitalized pediatric population. Pain Manag Nurs 2014;15:22-35. Pines JM, Hollander JE. Emergency department crowding is associated with poor care for patients with severe pain. Ann Emerg Med 2008;51:1-5. Lewis CP, Corley DJ, Lake N, Brockopp D, Moe K. Overcoming barriers to effective pain management: The use of professionally directed small group discussions. Pain Manag Nurs. 2015;16:121-7. doi: 10.1016/j.pmn.2014.05.002. Epub 2014 Nov 6. Ballweg D. Neonatal and pediatric pain management: Standards and application. Paediatr Child Health 2007;17:61-66. Gimbler-Berglund I, Ljusegren G, Enskär K. Factors influencing pain management in children. Paediatr Nurs 2008;20:21-4. Blondal K, Halldorsdottir S. The challenge of caring for patients in pain: From the nurse's perspective. J Clin Nurs 2009;18:2897-906. Al-Khawaldeh OA, Al-Hussami M, Darawad M. Knowledge and attitudes regarding pain management among Jordanian nursing students. Nurse Educ Today 2013;33:339-45. Timby BK, Smith NE. Introductory Medical-Surgical Nursing. 11th ed. New York: Lippincott Williams & Wilkins Company; 2013. p. 226. Fortier MA, MacLaren JE, Martin SR, Perret-Karimi D, Kain ZN. Pediatric pain after ambulatory surgery: Where's the medication? Pediatrics 2009;124:e588-95. Shrestha-Ranjit JM, Manias E. Pain assessment and management practices in children following surgery of the lower limb. J Clin Nurs 2010;19:118-28. Taylor A, Stanbury L. A review of postoperative pain management and the challenges. Curr Anaesth Crit Care 2009;20:188-94. Chng HY, He HG, Chan SW, Liam JL, Zhu L, Cheng KK, et al. Parents' knowledge, attitudes, use of pain relief methods and satisfaction related to their children's postoperative pain management: A descriptive correlational study. J Clin Nurs 2015;24:1630-42. Albertyn R, Rode H, Millar AJ, Thomas J. Challenges associated with paediatric pain management in sub saharan africa. Int J Surg 2009;7:91-3. Pretorius A, Searle J, Marshall B. Barriers and enablers to emergency department nurses' management of patients' pain. Pain Manag Nurs 2015;16:372-9. Twycross A. Nurses' views about the barriers and facilitators to effective management of pediatric pain. Pain Manag Nurs 2013;14:e164-72. Farahani PV, Alhani F, Mohammadi E. Effect of establishing pain committee on the pain assessment skills of paediatric nurses. Int J Nurs Pract 2014;20:499-509. Ljusegren G. Nurses' competence in pain management in children. Swedish: Scool of Health Sciences Jönköping University. Licentiate Thesis. Disseration Series No.16, 2011. Richards J, Hubbert AO. Experiences of expert nurses in caring for patients with postoperative pain. Pain Manag Nurs 2007;8:17-24. Lauzon Clabo LM. An ethnography of pain assessment and the role of social context on two postoperative units. J Adv Nurs 2008;61:531-9. Graneheim UH, Lundman B. Qualitative content analysis in nursing research: Concepts, procedures and measures to achieve trustworthiness. Nurse Educ Today 2004;24:105-12. Polit DF, Beck CT. Nursing Research: Generating and Assessing Evidence for Nursing Practice. 9th ed: New York: Lippincott Williams & Wilkins; 2012. Namnabati M, Abazari P, Talakoub S. Identification of perceived barriers of pain management in iranian children: A qualitative study. Int J Nurs Pract 2012;18:221-5. Batiha A-MM. Pain management barriers in critical care units: A qualitative study. Int J Adv Nurs Stud 2014;3:1-5. Stalpers D, de Brouwer BJ, Kaljouw MJ, Schuurmans MJ. Associations between characteristics of the nurse work environment and five nurse-sensitive patient outcomes in hospitals: A systematic review of literature. Int J Nurs Stud 2015;52:817-35. Rejeh N, Ahmadi F, Mohammadi E, Anoosheh M, Kazemnejad A. Barriers to, and facilitators of post-operative pain management in iranian nursing: A qualitative research study. Int Nurs Rev 2008;55:468-75. Bucknall T, Manias E, Botti M. Nurses' reassessment of postoperative pain after analgesic administration. Clin J Pain 2007;23:1-7. Parvizi F, Alhani F, Aghebati N. The nurses' problems in applying non-pharmacological pain management for children. IJNR 2008;3:85-92. [In Persian]. Varvani P, Alhani F. Assessment of barriers to pediatric pain assessment tools by nurses. J Nurs Midwifery Shahid Beheshti Univ Med Sci 2008;62:41-6. Borgsteede SD, Rhodius CA, De Smet PA, Pasman HR, Onwuteaka-Philipsen BD, Rurup ML, et al. The use of opioids at the end of life: Knowledge level of pharmacists and cooperation with physicians. Eur J Clin Pharmacol 2011;67:79-89. Twycross A, Forgeron P, Williams A. Paediatric nurses' postoperative pain management practices in hospital based non-critical care settings: A narrative review. Int J Nurs Stud 2015;52:836-63. Svendsen EJ, Bjørk IT. Experienced nurses' use of non-pharmacological approaches comprise more than relief from pain. J Pediatr Nurs 2014;29:e19-28. He HG, Pölkki T, Pietilä AM, Vehviläinen-Julkunen K. Chinese parent's use of nonpharmacological methods in children's postoperative pain relief. Scand J Caring Sci 2006;20:2-9. Park J, Hirz CE, Manotas K, Hooyman N. Nonpharmacological pain management by ethnically diverse older adults with chronic pain: Barriers and facilitators. J Gerontol Soc Work 2013;56:487-508.